Are you looking for a place of relaxation, look no further beyond Malakai Eco Lodge. The environmentally friendly lodge facility is a very beautiful place surrounded with nice looking natural environment. The lodge is located just 20 minutes’ drive from Entebbe International Airport and 40 minutes’ drive from Kampala city. 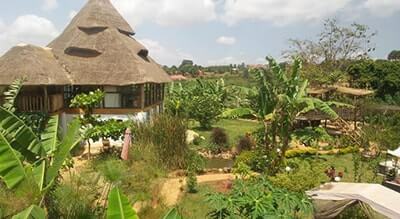 Being in the middle of the distance between Kampala and Entebbe, Malakai Eco Lodge is tourists’ paradise. Several Travellers of Uganda Safaris sleep at the place either at the begening of the tour or at the end of it or both. 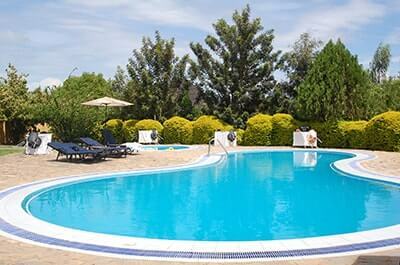 The lodge is well built in pristine cool environment just quiet very close to Kitende off Entebbe road. The lodge has beautiful gardens which are embedded with volcanic stone huts all covered up with natural flowers that makes the place look very stunning. There are water fountains that that makes the fresh stay cool all the day through, there are fish ponds which are well maintained with nice flowers flourishing on the top of the waters hence maintaining a green view of the place. There are other plat forms that are put on top of the fish pond, others are raised on top of the group which enables the visitors to sit chill and relax at in plats forms as you enjoy the drink or be reading. There is a big swimming pool that is kept clean all the time and water is kept warm, to those who love swimming, Malakai Eco Village is the best place for you. The cottages are noisy free, there is no radios, television instead you will listen to sounds of birds and the natural sounds. The place surely gives one the best comfort. During the evening hours, the gardens are used as open air restaurants for intimate dinner from the local or continental cuisine. Very comfortable sits are provided for one to spend your evening while relaxing or having a conversation with guests. Malakai eco lodge is the best place to chill out and relax from, you can spend a night here, and the place has got nice looking cottages with very clean beds that are built in an African style. The cottages at Malakai are built using African construction materials such as grass, there are a number of different artifact traditional designs. Just come to Malakai and enjoy the best of your time.